Of course, if I'm going to get all misty-eyed and sentimental about small bookshops, I should also say something about indie video stores as well. 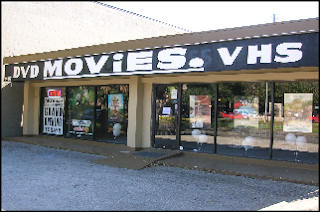 So here's an unsolicited plug for MOViES The Store, Houston's newest homevid outlets for discerning cineastes. It's a labor of love for Rob Arcos, formerly the local ramrod for Landmark Theatres. He's a real fan, and he stocks his shelves accordingly. How low (budget) can you go? Gore for President? Fat chance! 'Ghost Rider' spooked by critics? From 'Homicide' to Grand Theft Auto? A blast from the past? What if they opened a movie and nobody came?